Just because we've crossed the threshold from Christmas to Boxing Day doesn't mean that you can't retain the holiday spirit. And The Venture Bros. are here to help, with classic holiday tunes sung by your favorite villains and henchmen. Each year, Jackson Publick, Doc Hammer, and the rest of the folks behind The Venture Bros. cover a holiday song in the voices of their animated alter egos. The Monarch, Dr. Girlfriend (now Mrs. Dr. The Monarch), and their henchmen are especially festive during the holiday season. In 2006, supervillain and superscientist supergroup "Venture Aid" covered Band Aid's "Do They Know It's Christmastime?" In 2007, the Monarchs took on The Pogues' "Fairytale of New York." 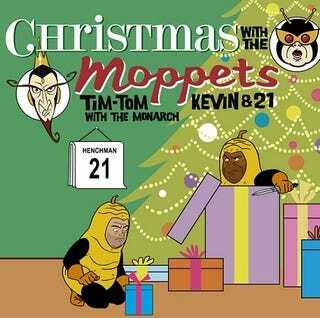 And last year, in a tragic move, Henchman 21 prerecorded himself and Henchman 24 singing "Wonderful Christmastime." Sadly, Henchman 24 didn't survive to see Christmas that year. Check out Quick Stop Entertainment for other Venture Christmas carols, including a cover of David Bowie and Bing Crosby's "Peace On Earth"/"Little Drummer Boy" medley, the Monarch and his loyal henchmen taking on Dolly Parton's "Hard Christmas Candy," and this year's Christmas song — The Monarch covering "The Chipmunk Song" with the help of Henchman 21 and the Moppets.